Ritual. During my train rides to and from work, I will read non-fiction on my way in to work and fiction on the way home. That has been my habit for the past seven years. For example: Over the past couple of weeks I have been reading from N.T. Wright’s Kingdom New Testament and Leon Lederman’s & Christopher Hill’s Beyond the God Particle (Higgs boson, particle physics ‘stuff’) during the morning ride into work – it is a long haul. I am a ‘morning’ person so I can handle ‘deep thinking’ right out of the gate. During this same time but on the flip side, and breaking with habit, I am reading an autobiography: Taking the Stand, My Life in the Law, by Alan Dershowitz. I’m doing this to catch up with all my recent book purchases. More than this, though, Dershowitz’s life – “in the Law” was of special interest to me. There are a lot of important legal issues being dealt with currently. Alan Dershowitz has impacted some of the court’s rulings over the course of his life’s passion – freedom of speech. Much of his knowledge of the law was earned as a law clerk under some ‘heavy-weight’ judges and then later from working with the legal problems of various ‘famous’ or ‘infamous’ clients. But getting to the point of this post, ritual and law, the moral Truth of the New Testament and even the constants and space-time events of physics all play a part in a short story I want to recommend to you. The confluence of these interests coming from different directions goaded my desire to share it with you. The short story can be found in a compilation of short stories written by Andre Dubus. The book’s simple and direct title: Andre Dubus, Selected Stories. 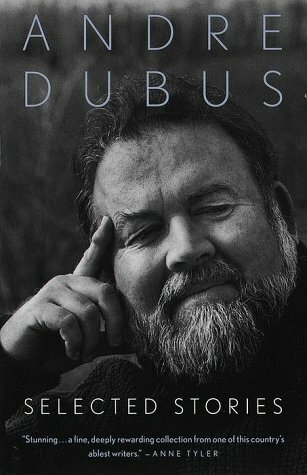 I like the fact that Dubus writes with a definite masculine voice. His is not a macho voice but a male point of view you would get from a down-to-earth kind of guy. On the other side of the aisle, another short story writer and a Nobel Prize winner in literature, Jill Munro, pens stories with a distinctly female voice. I am reading her Dear Life collection of short stories on the weekends. But let’s get back to Dubus and the short story at hand. When I read Andre Dubus’ A Father’s Story, I immediately empathized with the narrator, Luke Ripley. Luke is divorced, single, and an empty nester with three sons and a daughter off somewhere else. Viscerally and literally Luke and I have a lot in common. His solitary life is lived in a ritual. We soon learn of Luke’s morning habit of prayer while making his bed and then feeding his horses. His evening ritual is that of sitting alone in the dark after dinner, smoking cigarettes and listening to operas. His morning habits also include seeing a priest ~ Father Paul Leboeuf, his best friend. Most mornings Luke rides one of his horses (he has a riding stable) over to church where Father Paul’s officiates. There Luke hears the Mass and receives the Eucharist. During the week the two men get together for a dinner meal. With Father LeBeoeuf present and a can of beer in hand Luke verbally grieves his despair over losing his wife and his family. “It is not hard to live through a day, if you can live through a moment. What creates despair is the imagination, which pretends there is a future, and insists on predicting millions of moments, thousands of days, and so drains you that you cannot live the moment at hand. That is what Father Paul told me in those first two years, on some bad nights when I believed I could not bear what I had to: the most painful loss was my children, then the loss of Gloria, whom I still loved despite or maybe because of our long periods of sadness that rendered us helpless, so neither of us could break out of it to give a hand to the other. Twelve years later I believe ritual would have healed us more quickly than the repetitious talks we had, perhaps even kept us healed. Marriages have lost that, and I wish I had known then what I what I know now, and we had performed certain acts together every day, no matter how we felt, and perhaps then we could have subordinated feeling to action, for surely that is the essence of love. I know this from my distractions during Mass, and during everything else I do, so that my actions and my feelings are seldom one. It does happen every day, but in proportion to everything else in the day, it is rare, like joy. Jennifer has grown up. He recounts how her ‘change’ affected the ‘ritual’ of memories he kept of her as his sheltered little girl at home. Jennifer has become an ‘unsheltered’ on-her-own twenty-one year old girl with a purse full of adult symbols including a driver’s license. More change: the story then drives us off the road of ritual and into a deadly serious situation. Luke, a father of a daughter, has to make a life-altering decision. After his decision is made we find out if Luke returns to ritual, perhaps a ritual without the peace of mind that ritual had always supplied in the past? This is all I will share of A Father’s Story. It is best that you read it for yourself. The story is here in PDF form so, you can read it on-line or you can print it out and read it…on the train. Along with empathizing with Luke on many levels and experiencing some of the same grief and despair that he experienced, I also reflected on the situation ethics that you meet head-on in the story. -As a parent what would I do in this situation? -Jennifer: was it cruel and unjust to everyone involved to let things ‘go on’ by not doing the ‘right thing’? -Would the scenario played out be as if were God testing Luke as he tested Abraham about using his son Isaac as a sacrifice? -In the end did Luke really just act out of laziness (laziness being the opposite of love) in order to maintain ritual ~ life as he knew it and wanted it to go on being ~ at all costs? Please give me your feedback in comment section. Now where did I put that other book…?